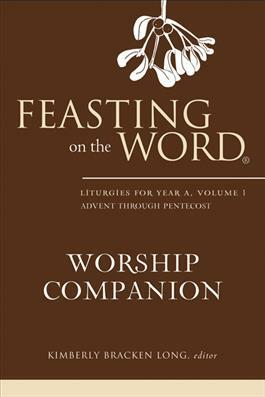 Based on the Revised Common Lectionary (RCL), Feasting on the Word Worship Companion: Liturgies for Year A, Volume 1 is an invaluable aid that provides liturgical pieces needed in preparing for worship each week. Written and compiled by a team of eleven ecumenical and seasoned liturgy writers under the creative leadership of Kimberly Bracken Long, this resource offers a multitude of poetic prayers and responsive readings for all parts of worship and is meant to complement existing denominational resources. In addition, the weekly entries include questions for reflection and household prayers for morning and evening that are drawn from the lectionary, allowing churches to include them in their bulletin for parishioners to use throughout the week. During times of the year when two different tracks of Old Testament texts are offered by the RCL, this resource offers an entire set of materials for each track. A CD-ROM is also included with each volume that enables planners to easily cut and paste relevant readings, prayers, and questions into worship bulletins.